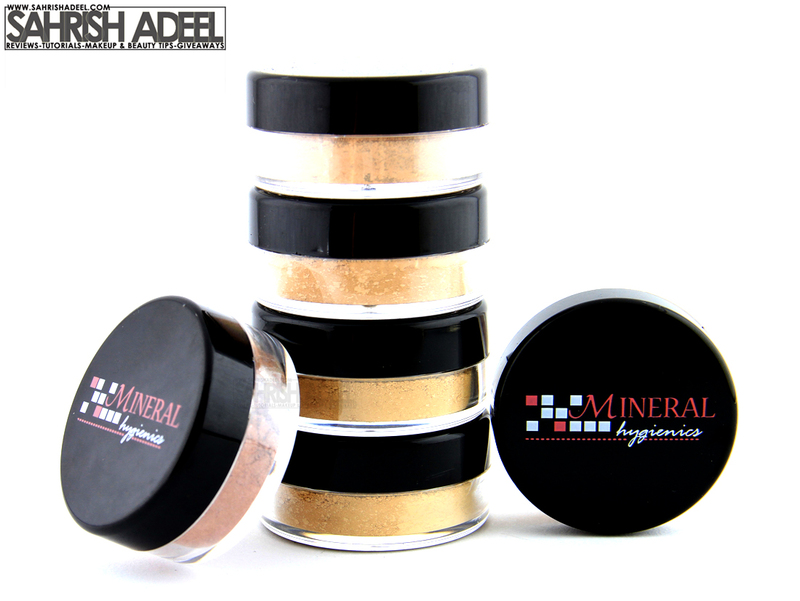 Mineral Makeup Foundation by Mineral Hygienics - Review & Swatches! | Sahrish Adeel - Malaysia based Pakistani Beauty & Lifestyle Blogger! Mineral Makeup Foundation by Mineral Hygienics - Review & Swatches! A mineral foundation that claims to be the best in every way possible. I tried it & lets see how I found it? The foundation I am going to review is by Mineral Hygienics. According to them, their products are 100% natural and have so many other benefits as well. The properties of their makeup range, according to them: "HD Ready, Nano Free, Better Colors, SPF Protection, Fewer Ingredients, Water/Sweat Resistant, Designed for Sensitive Skin, Super Lightweight, Anti-Inflammatory, Longest Lasting, Better Coverage, Even Skin Tone, Will Not Streak, Healthier". They also claim to amaze you with their products. I really wanted to accept this challenge as I always had problems with my foundations because of my oily skin, humid weather (throughout the year) & house chores when I have guests at my place (specially cooking & serving). 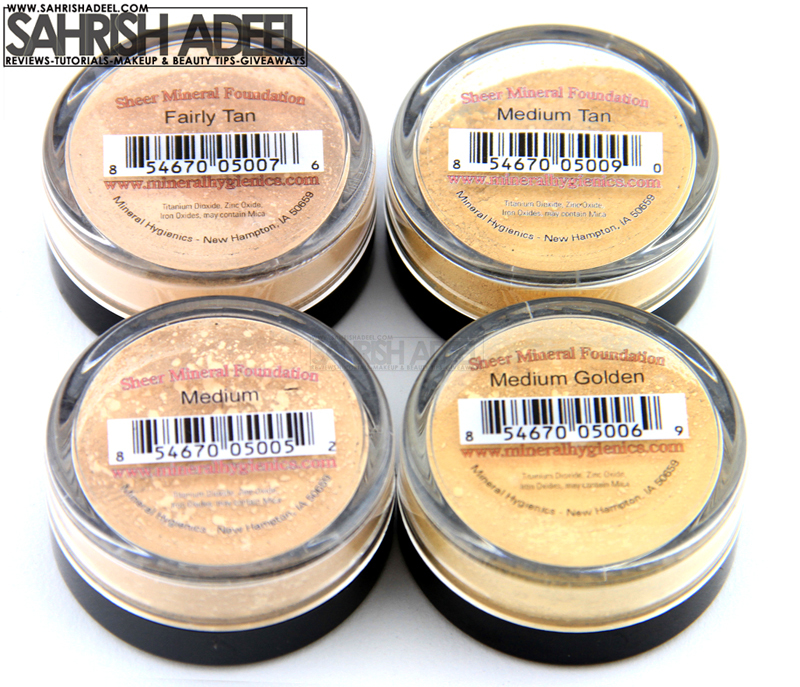 I received four shades out of their range of 14 shades of mineral foundation. These shades are Fairly Tan, Medium Tan, Medium & Medium Golden. Lets move to the review. Keeps you shine free for longer hours. Extremely light weight, you wont even feel that you are wearing a foundation, even if you go for full coverage. Suitable for highly sensitive skin as well. Gives light to almost full coverage (depends on layering). Stays all day till night. No creasing under eyes or around nose (i don't have wrinkles or fine lines yet). Does not give any side effects or break outs at all (update Jan/2013: been using it for over one year now). I could not find any bad thing about this foundation. Open the images below in a new window to have a better look. These are the swatches of all of the above mentioned four shades. They have not been blended so you could have a better look at the shades and their tones. My shade is Medium and you can see that the edges of the swatch for the Medium shade, matches really good with my skin tone. Open image in a new window to have a better look. I took Mineral Hygienics' challenge seriously and gave this foundation a really good try. I applied it from morning till night, it lasted without creasing. I applied it and worked out for over 30 minutes and sweat did not do any bad to it. I applied it before cooking, it stayed. I splashed my face with water, it did not rinse. But it will obviously go away, if you will rub it. I did face cleansing & polishing with my cleansing & polishing tool and usually my sensitive skin can not afford to have any chemical on it afterwards for about one day. It itches and gets more red. But I even applied this foundation after that and it did not sting, itch or irritate my skin. Infact, it minimized the inflammation and itchiness a bit. In short, this product really did amaze me. However, you may need a concealer if you have spots, redness, blemishes or dark circles, as it does not cover that up 100%. I would recommend this product to you if you feel you have same skin type as I do. I am sure I will stick to this foundation. I have been using this foundation for almost one year now. I have absolutely same views as they were in the start. I have been using this foundation whenever my skin is acting sensitive. In between I use my other foundations. I also love to layer it over my liquid foundation; 1. to seal the foundation in place & 2. to achieve full coverage. Click here to see that look. I have not used any concealer in this look. I am having really bad under eye circles these days but you can see that the products by Mineral Hygienics have almost covered them up. Each full size jar of foundation contains 40 gram of product and costs $25. These are available in 14 different shades. Mineral Hygienics ships worldwide. Check out there website here to shop a starter kit for yourself and many other products. I hope you have enjoyed reading this post. Don't forget to share it ahead and follow my blog if you haven't already.